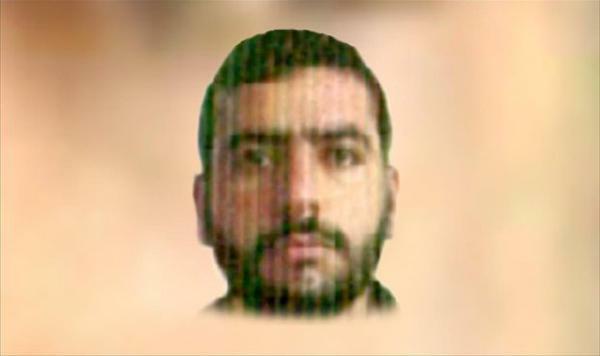 Two of the very few pictures of Hamid al-Zawi (Abu Umar al-Baghdadi) in existence. The picture on the right, taken after al-Zawi was killed in April 2010, is most often used in Islamic State media. Hamid al-Zawi (Abu Umar al-Baghdadi), the first emir of the Islamic State when it was founded in 2006, gave his third speech—”Say, I Am Aware of My Lord” or “Say, I Am on Clear Proof from My Lord”—on 13 March 2007. An English transcript of the speech was released online by the Jihad Media Battalion and a video of part of the speech was released, entitled, “This Is Our Doctrine”, a neat encapsulation of the speech’s content. The speech is an interesting first-hand statement of what the Islamic State actually believes, and is reproduced below. This entry was posted in Abu Umar al-Baghdadi Speeches, Jihadi Output and tagged Abu Omar al-Baghdadi, Abu Umar al-Baghdadi, apostates, Hamid al-Zawi, Hamid az-Zawi, Hamid Dawud Muhammad Khalil al-Zawi, Iraq, ISIS, Islamic State, Islamic State of Iraq, jihad, Pact of Umar, sectarianism, shirk, takfir on January 12, 2017 by KyleWOrton. This entry was posted in Iraq, Islamic Militancy, Jihadi Biographies, Saddam and Islamism, Syria and tagged Abd al-Rahman Mustafa al-Qaduli, Abd ar-Rahman Mustafa al-Qaduli, Abu Ala al-Afri, Abu Ali al-Anbari, Abu Bakr al-Baghdadi, Abu Mohammed al-Adnani, Abu Muhammad al-Adnani, Abu Musab al-Zarqawi, Abu Musab az-Zarqawi, Abu Muslim al-Turkmani, Abu Omar al-Shishani, Afghanistan, Ayman al-Zawahiri, Ayman az-Zawahiri, Fadel Ahmad Abdullah al-Hiyali, Fadel al-Hiyali, faith campaign, Haji Bakr, Haji Iman, Haji Mutazz, Hamid al-Zawi, Hamid az-Zawi, Ibrahim al-Badri, Iraq, Osama bin Laden, Saddam Hussein, Samir Abd Muhammad al-Khlifawi, Samir al-Khlifawi, Syria, Taha Falaha, Taha Subhi Falaha, Tarkhan Batirashvili on March 25, 2016 by KyleWOrton. In the last few months I’ve increasingly focussed on the former (Saddam) regime elements (FREs) within the Islamic State (I.S.). There’s now an entire section on this blog about it, and Aaron Zelin over at Jihadology recently gave me time to elaborate in a podcast. In studying this topic there is one inescapable name: Samir Abd Muhammad al-Khlifawi, better-known by his pseudonym Haji Bakr, and sometimes by his kunya, Abu Bakr al-Iraqi. Al-Khlifawi is a former colonel in an elite intelligence unit of the Saddam Hussein regime—focussed on air defence at Habbaniya airbase, though what exactly that entails is murky. Al-Khlifawi was also apparently involved in weapons development. This entry was posted in Iraq, IS Relations With Al-Qaeda, Islamic Militancy, Jihadi Biographies, Saddam and Islamism, Syria and tagged Abu Ala al-Afri, Abu Ali al-Anbari, Abu Atheer al-Absi, Abu Ayman al-Iraqi, Abu Ayyub al-Masri, Abu Bakr al-Baghdadi, Abu Bakr al-Iraqi, Abu Hamza al-Muhajir, Abu Muhammad al-Golani, Abu Musab al-Zarqawi, Abu Musab az-Zarqawi, Abu Nidal, Abu Omar al-Baghdadi, Abu Omar al-Shishani, Abu Sulayman an-Nasr, Abu Suleiman al-Naser, Adnan al-Suwaydawi, al-Qaeda, Amniyat, Amr al-Absi, Atiyya, Ayman al-Zawahiri, Ayman az-Zawahiri, Baathism, Camp Bucca, faith campaign, Grand Mosque siege, Haji Bakr, Haji Iman, Hamid al-Zawi, Hamid az-Zawi, Ibrahim Awwad al-Badri al-Samarrai, Iraq, ISIS, Islamic State, Jabhat al-Nusra, Jabhat an-Nusra, Jamal al-Misrati, Juhayman al-Utaybi, KGB, Muhammad al-Nada al-Jabouri, Muhammad al-Nada al-Jiburi, Muhammad an-Nada al-Jabouri, Neaman az-Zaydi, Neaman Salman Mansour al-Zaidi, Numan az-Zaydi, Osama bin Laden, Sabri al-Banna, Saddam Hussein, Salafi-jihadism, Salafi-jihadists, Samir Abd Muhammad al-Khlifawi, Samir al-Halefawi, Samir al-Khlifawi, STASI, Syria, Tarkhan Batirashvili, WikiBaghdady, Yusuf ad-Dardiri on November 10, 2015 by KyleWOrton. An Islamic State (ISIS) commander was killed in Libya in mid-June, The Daily Beast reported yesterday, after being “paraded … through the streets amid the taunts of onlookers, and then walked … to a gallows, where he was hanged.” This occurred in the eastern city of Derna, long a hotbed of Islamic militancy. The crucial thing about the “executed” ISIS operative is that he was an Iraqi and an FRE—a former (Saddam) regime element—who had been dispatched to Libya last year to oversee the cultivation of an ISIS branch. This entry was posted in Iraq, Islamic Militancy, Jihadi Biographies, Libya, Saddam and Islamism, Syria and tagged Abu al-Mughirah al-Qahtani, Abu Ali al-Anbari, Abu Bakr al-Baghdadi, Abu Mughira al-Qahtani, Abu Musab al-Zarqawi, Abu Musab az-Zarqawi, Abu Nabil al-Anbari, Abu Omar al-Baghdadi, Abu Salim Martyrs' Brigade, Abu Umar al-Baghdadi, Abul-Mughirah al-Qahtani, al-Majlis Shura al-Mujahideen, al-Qaeda, Ansar al-Shari'a, Ansar al-Shari'a Libya, Colonel Gaddafi, Darna, Derna, Hamid al-Zawi, Hamid az-Zawi, Hamid Dawud Muhammad Khalil al-Zawi, Iraq, ISIS, Islamic State, KGB, Libya, Muammar el-Qaddafi, Saddam Hussein, Salafi-jihadists, Syria, The Mujahideen Shura Council, The Mujahideen Shura Council in Derna, Wilayat Derna, Wissam al-Zubaydi, Wissam Najm Abd Zayd al-Zubaydi, Wissam Najm Abd Zayd az-Zubaydi on July 21, 2015 by KyleWOrton. This entry was posted in Jihadi Biographies, Jihadi Output and tagged Abdul Munim al-Badawi, Abu al-Bashair, Abu al-Ghadiya, Abu Anas al-Shami, Abu Ghadiya, Abu Ghadiyah, Abu Hamza al-Muhajir, Abu Maysara al-Gharib, Abu Muhamad al-Adnani, Abu Muhammad al-Lubnani, Abu Musab al-Zarqawi, Abu Omar al-Baghdadi, Abu Omar al-Shishani, Abu Umar al-Baghdadi, Abu Umar al-Shishani, Ahmad al-Khalayleh, al-Qaeda, Hamid al-Zawi, Hamid az-Zawi, ISIS, Islamic State, jihadism, Maysara al-Gharib, Muhammad ibn Abd al-Wahhab, Mustafa Darwish, Mustafa Ramadan Darwish, Omar Yousef Juma'a, Sayyid Qutb, Sulayman Khalid Darwish, Suleiman Khalid Darwish, Taha Falaha, Taha Subhi Falaha, Tarkhan Batirashvili, Turki al-Bin'ali, Turki ibn Mubarak al-Binali, Umar Yusef al-Juma on November 8, 2014 by KyleWOrton.